A technician has installed SwitchB and needs to configure it for remote access from the management workstation connected to SwitchA. Which set of commands is required to accomplish this task? To remote access to SwitchB, it must have a management IP address on a VLAN on that switch. Traditionally, we often use VLAN 1 as the management VLAN (but in fact it is not secure). In the exhibit, we can recognize that the Management Workstation is in a different subnet from the SwitchB. For intersubnetwork communication to occur, you must configure at least one default gateway. 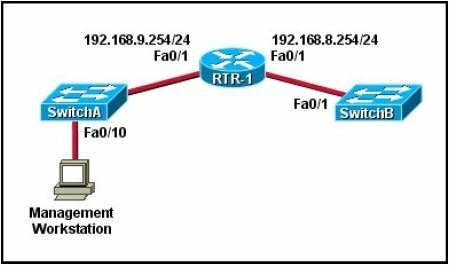 This default gateway is used to forward traffic originating from the switch only, not to forward traffic sent by devices connected to the switch.